The Big East's chances for a monumental tournament were dealt severe blows with season-ending injuries to point guards for two of their four ranked teams project both as first round losers rather than winners. 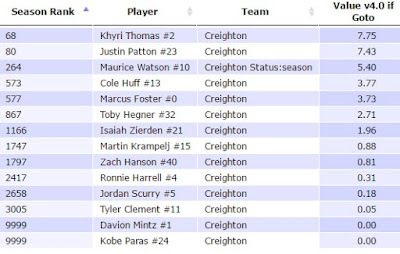 The injury to Mo Watson before Creighton's game against Marquette indicates their Sagarin Rating of 87.56 (21st overall) is actually 84.12 (34th, one spot behind Marquette) without Watson, whose Value Add is 5.40 (points per game impact). 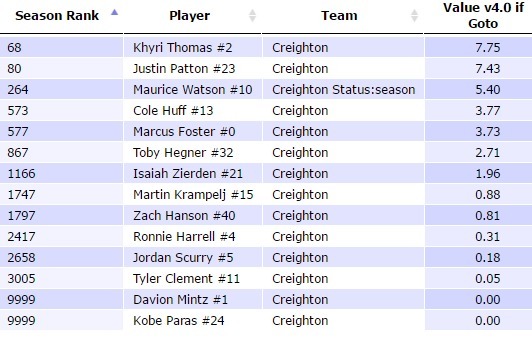 Due to the Domino effect of losing a player (see explanation in Big Apple Buckets), you subtract the value of a team's seventh best player (1.96 for Creighton) to get the actual impact in points per game off their Sagarin Rating so 87.56 for season to date, MINUS 5.40 for how many of those points were the result of Watson being on the floor, PLUS 1.96 to estimate the overall additional points based on the strength of Creighton's other players who need to extend their game. Unfortunately, the news is even more devastating for Xavier with Edmond Sumner going down for the season with an ACL. Sumner is a top 100 player with a 7.32 Points Per Game Impact (Value Add), so the math for Xavier's Sagarin Rating without him is 86.79 (24th best) MINUS his 7.32, PLUS their 7th best player's 1.89 for a new rating of 81.36 for 56th place without Sumner. They should certainly still make the tournament, but they will need players to step up beyond what is expected to get a win in the tournament. On the flip side, I do not see any Big East teams who have a late comer (2nd semester transfer or player returning from injury) who will elevate them substantially. However, to give an example of teams that might be improving, I point to star Austin Wiley of my hometown team Auburn. My graphics are not great, but Wiley is a potentially dominant center who so far is worth 1.96 points - but when you scroll to the right the final number of ^12^ indicates he only played 12 of the teams 21 games. Because he has played in tougher SEC games, you would expect his value to actually be at least double even though he has played slightly more than half the games. (When a player is not on the floor he gets a ZERO Value Add for that game). Therefore he is probably about a 3.92 rather than a 1.96, so if you add the additional 1.96 to Auburn's Sagarin rating of 78.94, the real team rating with Wiley is 80.83, a jump from 72nd to 60th. Auburn has an uphill battle to make the tournament because the games they played before Wiley still count, but it appears Bruce Pearl has a team that is at least on the verge of being March Madness quality, so if they can win 22 games between the regular season and SEC tournament - starting with a win against a hot Tennessee team tonight, they could sneak in. Unlikely, but at 60th a team that could easily make the NIT and win at least one game. I hope this post works as a Value Add guide to measure the impact of missing and returning players and understand who much they impact a teams actual Sagarin rating and if they should be favored in a given game.